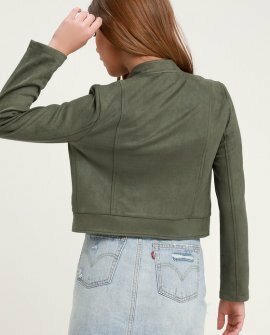 The Jack by BB Dakota Dive Bomb Olive Green Suede Moto Jacket is a sleek addition to your next night out! Soft vegan suede is slightly stretchy as it creates a collarless neckline and fitted long sleeves. Long lapels lead into an open front design with zipper accents. Twin zipper pockets and a slightly cropped hem complete this edgy look!